It felt like summer all day, but the Red Sox brought back some of the autumnal magic after midnight, beating the Angels, 6-3, on Manny Ramírez's monstrous walkoff, three-run homer to take a commanding 2-0 lead in their best-of-five American League Division Series. The game lasted 4 hours 5 minutes and ended at 12:44 this morning. Shades of 2004. Indians defeat Yankees, 2-1, in 11 innings to take 2-0 lead in series crushed a 1-0 pitch from closer Francisco Rodriguez, driving the ball over the Coke bottles and into history. A motorist heading eastbound on the Mass. Pike would have been threatened by the sight of Ramírez's blast cutting through the October sky. "In that moment, I am just trying to see the ball and trust myself," Ramirez said in a rare appearance in the postgame interview room. "I ain't trying to do too much. You know, I got a lot of confidence in myself. He's one of the greatest closers in the game and I am one of the best hitters in the game. You know, he missed his spot, and I got good timing on the ball and that's it. "It feels great, man. It's been a long time I don't do something special like that. But I haven't been right all year round. But I guess, you know, when you don't feel good and you still get hits, that's when you know you are a bad man." This was a night when Daisuke Matsuzaka looked like a $100 bust, and a teenage Red Sox fan - sitting in front of Stephen King - kept a rally alive with a barehanded catch of a Ramírez foul popup. It was a night when Boston's bolstered bullpen flexed its muscles. 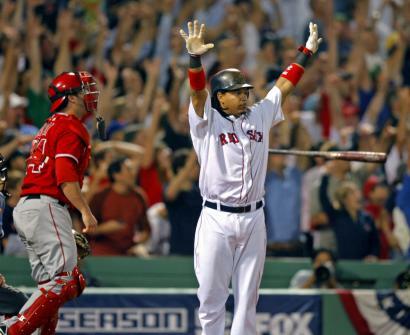 But the 37,706 witnesses will remember only Manny, arms raised at home plate as the ball soared over the plastic bottles toward the Charles River. The series resumes in Anaheim tomorrow afternoon with Curt Schilling making his first postseason appearance since Bloody Sock II against the Cardinals in the 2004 World Series. "We accomplished what we set out to do today," said Red Sox manager Terry Francona. "It wasn't very easy. Our bullpen was outstanding. They gave us a chance." "We have to scratch and claw our way back into the series," said Angels manager Mike Scioscia, who is on the brink of having his team swept by the Red Sox for the second time in four seasons. "It can be done. I've seen some good signs. This can be done; we just have to stay short-focused and go pitch to pitch." Going back to 1986, the Angels have lost eight consecutive playoff games to the Red Sox. Righthander Jered Weaver will get the ball for the desperate Halos tomorrow. The drama built slowly in the second game of this Division Series. Luis Tiant, the last Red Sox pitcher to throw a shutout in the postseason (before Josh Beckett Wednesday), assumed ceremonial first-pitch duties, much to the joy of the Fenway legions. It might not have been a bad idea to let El Tiante stick around and throw the first five innings. It was a steamy 79 degrees when Matsuzaka threw his first pitch to Chone Figgins at 8:39 p.m. He needed 31 pitches to get the first three outs, and it was clear we were not headed for a second consecutive 2-hour-27-minute game. Scorned all season, J.D. Drew smoked a single with the bases loaded off righthander Kelvim Escobar to give the Red Sox a 2-0 lead in the bottom of the first. Sox fans experienced mixed emotions in the top of the second as Matsuzaka struggled with his control, gave up three hits and a walk, and coughed up the lead. Fans were booing Matsuzaka when old friend Orlando Cabrera doubled home Figgins to put the Angels ahead, 3-2, but the Monster scoreboard operator brought joy to the masses, posting Cleveland's 2-1, extra-inning win over the Yankees. The Indians lead the Yankees, 2-0, and loom as an AL Championship Series opponent for the winner of this joust. Francona decided he'd seen enough of Matsuzaka when the Japanese rookie got into a jam in the fifth. The trouble started with two out when Matsuzaka failed to cover first on a line drive to the right side that Kevin Youkilis almost gloved. When the ball rolled free and Dustin Pedroia scooped it up, there was no one covering first to take a throw. Matsuzaka walked the next batter, throwing a wild pitch on ball four, and Francona popped out of the dugout. Matsuzaka finished with 96 pitches, giving up seven hits and three walks. He was replaced by lefty Javier Lopez, who induced an inning-ending grounder. "A lot of pitches, a lot of deep counts, but he didn't cave in," Francona said when asked about Matsuzaka. With two on and one out in the fifth, Ramírez hit a popup that should have been the second out, but 17-year-old Danny Vinik - son of a Sox limited partner and now Boston's anti-Steve Bartman - saved Manny by barehanding the pop just before it was about to plop into the outstreched mitt of catcher Jeff Mathis. Ramírez wound up walking, then Mike Lowell tied the game with a sacrifice fly. The Red Sox bullpen took over from there as Lopez, Manny Delcarmen, Hideki Okajima, and Jonathan Papelbon smothered the anemic Angels lineup. Making matters worse for the Californians, slugger Vladimir Guerrero left in the late innings with a bruised shoulder sustained when he was hit by a Delcarman pitch. The Angels put runners on second and third (Lowell error and a walk) against Papelbon with two out in the bottom of the eighth, but the Sox closer slammed the door, getting Figgins to look at an 88-mile-per-hour split-finger fastball that cut through the strike zone. After "Sweet Caroline," the Sox went out in order in the eighth and Papelbon returned to get the Angels 1-2-3 in the ninth. Then came the bottom of the ninth, when it finally started to feel like October again. Julio Lugo singled to left off Angels reliever Justin Speier on the first pitch. With Lugo running, Pedroia grounded to short, moving the winning run to second. Rodriguez came in to face Youkilis and struck out the first baseman. After David Ortiz (four walks and a single) was intentionally walked, Ramírez hit the tape-measure shot. It was his first home run since Aug. 28. "My timing all year hasn't been right, but even when I'm not right, I get hits," said Ramírez. "I'll never go down. I'm always working hard. That's me, man . . . I'm just trying to be patient . . .
"[The walkoff home run was] one of the best feelings ever. You know, I never look for pitches. I always trust myself. Sometimes you get me and sometimes I get you, and I got him at the right time." "Manny is such a great hitter to have behind David," said Francona. "He made them pay." It was the fifth walkoff home run in Red Sox postseason history. The others were hit by Ortiz (two), Trot Nixon, and a fellow named Carlton Fisk. Dan Shaughnessy can be reached at shaughnessy@globe.com.